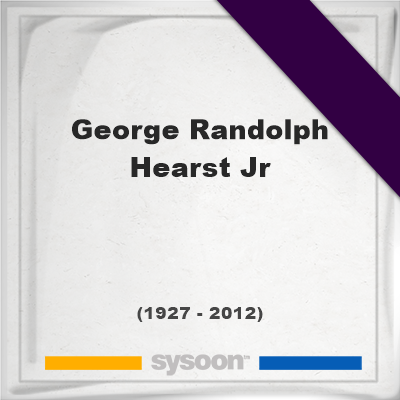 This memorial website was created in memory of our loved one, George Randolph Hearst, Jr., 84, born on July 13, 1927 and passed away on June 25, 2012. Where George Randolph Hearst, Jr. is buried? Find the grave of George Randolph Hearst, Jr. Locate the grave of George Randolph Hearst, Jr..
How George Randolph Hearst, Jr. died? How to find family and friends of George Randolph Hearst, Jr.? What can I do for George Randolph Hearst, Jr.? Funeral of George Randolph Hearst, Jr. Biography and Life of George Randolph Hearst, Jr. He was an American businessman, chairman of the board of the Hearst Corporation from 1996 through to his death in 2012. Hearst was a director of the company for more than 50 years,he succeeded his uncle, Randolph A. Hearst, as board chairman in 1996. Hearst Corp. owns 15 daily newspapers, including the Houston Chronicle, San Antonio Express-News and San Francisco Chronicle. It also owns a long list of magazines, including Esquire, Harper's Bazaar and Cosmopolitan, 29 TV stations and shares in several cable networks. Note: Do you have a family photo of George Randolph Hearst, Jr.? Consider uploading your photo of George Randolph Hearst, Jr. so that your pictures are included in George Randolph Hearst, Jr.'s genealogy, family trees & family history records. Sysoon enables anyone to create a free online tribute for a much loved relative or friend who has passed away. Public records of George Randolph Hearst, Jr.
Find birth, death, cemetery, marriage, divorce and historic vital records of George Randolph Hearst, Jr. Address and location of George Randolph Hearst, Jr. which have been published. Click on the address to view a map. George Randolph Hearst, Jr. was born in Los Angeles, California, United States. George Randolph Hearst, Jr. died in Palo Alto, California, United States. QR Codes for the headstone of George Randolph Hearst, Jr.
QR code for the grave of George Randolph Hearst, Jr.